Our winner is a knee pad that disappears when riding but protects when you need it to. Nobody plans their crashes but they are an unfortunate reality of our sport. So knee pads should be an obvious choice for mountain biking right? The problem is the knee pads of old let their presence be known on every pedal stroke. And on hot days, their lack of cooling and ventilation was very noticeable. 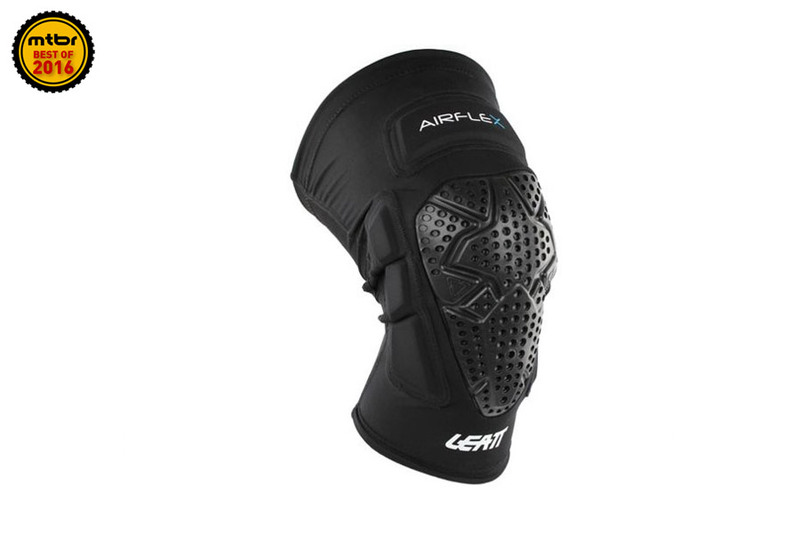 Enter the next generation of knee pads, most notably the Leatt Airflex. First and foremost, they protect very well. They feature an advanced, impact absorbing material that dissipates energy directed at the knee. And the new Pro version has added side and above knee protection for even more comprehensive coverage. We’ve crashed on this pad several times and it does its job well, staying in place and taking hits, saving us from skin gashes and bone injury. This pad also articulates very well during pedaling and stays in place during climbs and descents even without the aid of straps. Ventilation is ample. For more info, read our lightweight pad round-up here. The Alpinestars Paragon knee pads far outperform their $40 price tag. The Paragon knee guard is one of the best values going. For $40 you get a fully certified EN 1621.1 pad that’s comfortable and stays in place during pedaling and descending. In the rockiest descents of the Enduro World Series, we see this exact same pad protecting the likes of Jerome Clementz and Anneke Beerten. That’s saying something. For more info, check out our review here. 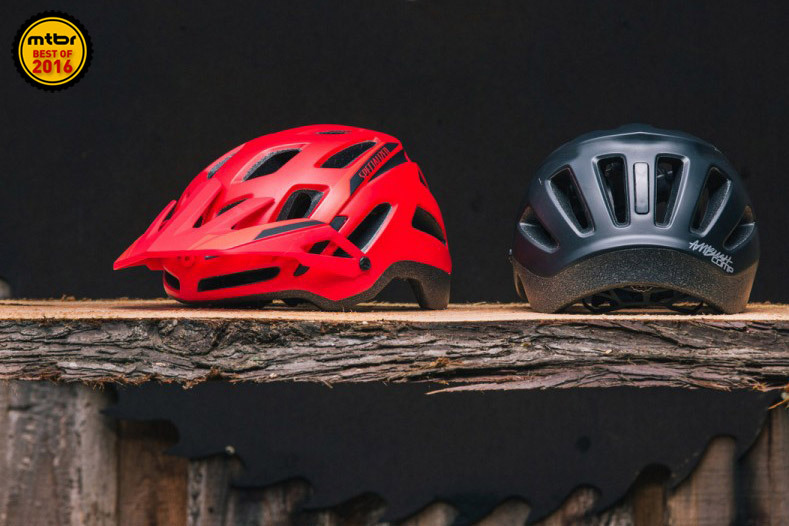 The Ambush Comp is incredibly affordable but scores an A in all the essential helmet attributes. We shared this last position between two of the best helmets available today, the Specialized Ambush Comp and Bell Super 3R. The Ambush Comp is an attractive, full-coverage helmet with good back of the head protection. It has a visor that moves out of the way to provide room for goggles. Ventilation is awesome and fit is incredible for this $120 lid. For more info, check out our review here. The Bell Super 3R fulfills the promise of the Super 2R removable chin guard helmet that launched a new class of brain protectors. 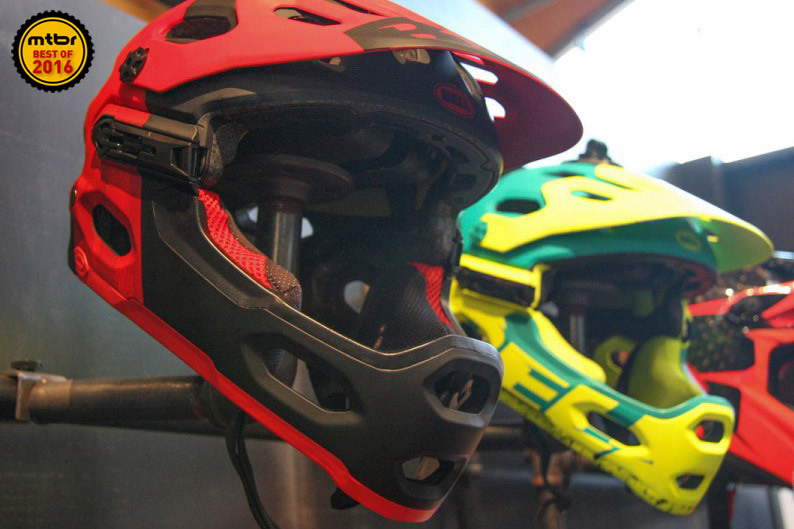 The $230 Bell Super 3R is the realization of Bell’s vision of providing a helmet with a removable chin guard. Excellent fit, low weight, good looks, and solid protection allow the rider to use a lightweight full-face helmet all the time or remove the chin guard on hot climbs. For more info, check out our coverage from Interbike here. The Alpinestars Paragon pads outperforms its $40 price. The Bell Super 3r fulfills the promise of the Super 2r removable chin guard helmet that launched a new class of helmets. A knee pad that disappears into the ride but protects when needed. Scott Grenade Pro II Knee pads. Best knee pads of all time.